One of the most eagerly awaited new slots is the Reactoonz slot that is the sequel to 2013’s classic Energoonz title. This new game from Play’n Go is due out before the end of the month and it has a similar look and feel to the original game. This means that it is very different from most slots out there, having more of an arcade, cartoon feel that felt completely unique when Energoonz. Since then, these games creators have also brought out the thrilling Gemix slot that added some fascinating features that helped move online slots off in new directions. Basically, while the brand new Reactoonz slot looks a lot like Energoonz it appears to play more like Gemix. This could give players the best of best worlds, with a fabulous look and exciting gameplay brought together in one place. The first thing you will notice on this game is that it is set up in a 7 x 7 reel layout that makes it look very different from standard 5 reel slots. Wins also become more thrilling, as it uses the cascading wins feature to replace winning symbols to offer the possible of a chain reaction of wins. 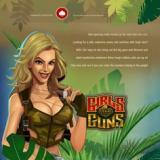 As it typical with Play’N Go slots, there is a wealth of bonus features to keep the action ticking along nicely. The main features on Reactoonz are called demolition, implosion, incision, alteration and gargatoon. Those features will all lead to changes such replacing symbols or adding wilds to the screen. This new game is well worth a try. You can find it on slick casinos such as the fantastic Mr Green site.